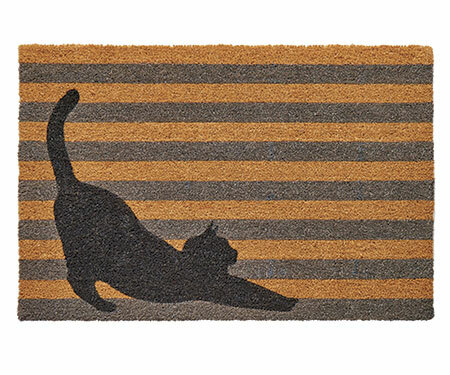 Featuring horizontal stripes of grey on a natural coir background with a stretching cat silhouetted in black, this large doormat is a beautiful addition to your entryway. The contemporary country styling in soft, subtle colours is just beautiful. This is a slimline doormat with natural coir fibres on a vinyl backing. Measures 60cm x 90cm and approx 1.5cm thick.